Why spend a day away from work (at least physically) in a conference room with a couple of hundred people? At the end of the day, that’s our ultimate goal for meshmarketing. After spending a day getting digital marketing insight from a lineup of speakers who work in the trenches, we want you to walk away with a long list of ideas to embrace, tactics to implement, online services to explore and people to connect with. The to-do list is how we want to make meshmarketing different from other digital marketing conferences. meshmarketing is not really about exploring big picture trends; it’s about gaining tactical insight to do digital marketing differently or better. Most people recognize they need to embrace digital marketing but they need guidance and direction on how to make it happen. 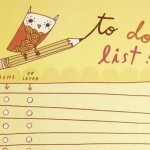 This is why the to-do list is such an important element of meshmarketing.